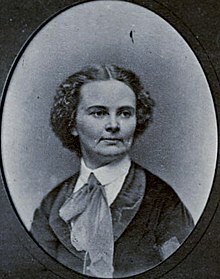 Harriet Hosmer was born on October 9, 1830 at Watertown, Massachusetts, and completed a course of study at Sedgewick School in Lenox, Massachusetts. Her mother and three siblings died during her childhood. She was a delicate child, and was encouraged by her father, physician Hiram Hosmer, to pursue a course of physical training by which she became expert in rowing, skating, and riding. He also encouraged her artistic passion. She traveled alone in the wilderness of the western United States, and visited the Dakota Indians. She showed an early aptitude for modeling, and studied anatomy with her father. Through the influence of family friend Wayman Crow she attended the anatomical instruction of Dr. Joseph Nash McDowell at the Missouri Medical College (then the medical department of the state university). She then studied in Boston and practiced modeling at home until November 1852, when, with her father and her friend Charlotte Cushman, she went to Rome, where from 1853 to 1860 she was the pupil of the Welsh sculptor John Gibson, and she was finally allowed to study live models. While living in Rome, she associated with a colony of artists and writers that included Nathaniel Hawthorne, Bertel Thorvaldsen, William Makepeace Thackeray, and the two female Georges, Eliot and Sand. When in Florence, she was frequently the guest of Elizabeth Barrett and Robert Browning at Casa Guidi. The artists included Anne Whitney, Emma Stebbins, Edmonia Lewis, Louisa Lander, Margaret Foley, Florence Freeman, and Vinnie Ream. Hawthorne was clearly describing these in his novel The Marble Faun, and Henry James called them a "sisterhood of American ‘lady sculptors'." As Hosmer is now considered the most famous female sculptor of her time in America, she is credited with having 'led the flock' of other female sculptors. The Sleeping Faun was created in 1865 in Rome, and was one of Hosmer's most celebrated works. Hosmer was drawn to the Neoclassical style, which was easy to study given her presence in Rome. She enjoyed studying mythology, and she created various representations of mythological icons, such as the sculpture of The Sleeping Faun, which includes intricate details of elements such as his hair, the grapes, and the cloth draped over him. She also designed and constructed machinery, and devised new processes, especially in connection with sculpture, such as a method of converting the ordinary limestone of Italy into marble, and a process of modeling in which the rough shape of a statue is first made in plaster, on which a coating of wax is laid for working out the finer forms. Hosmer later lived in Chicago and Terre Haute, Indiana. Hosmer exhibited her sculpture of Queen Isabella, commissioned by the Queen Isabella Association, in the California State Building at the 1893 World's Columbian Exposition in Chicago, Illinois. The statue was exhibited again in 1894 at the California Midwinter International Exposition. For 25 years she was romantically involved with Louisa, Lady Ashburton, widow of Bingham Baring, 2nd Baron Ashburton (died 1864). In the 19th century women did not usually have careers, especially careers as sculptors. Women were not allowed to have the same art education as men, they were not trained in the making "great" art such as large history paintings, mythological and biblical scenes, modeling of figure. Women usually produced artwork that could be done in their home, such as still lives, portraits, landscapes, and small scale carvings, although even Queen Victoria allowed her daughter, the Princess Louise, to study sculpture. Hosmer was not allowed to attend art classes because working from a live model was forbidden for women, but she took classes in anatomy to learn the human form and paid for private sculpture lessons. The biggest career move she made was moving to Rome to study art. Hosmer owned her own studio and ran her own business. She became a well-known artist in Rome, and received several commissions. Hosmer commented on her break from tradition by saying "I honor every woman who has strength enough to step outside the beaten path when she feels that her walk lies in another; strength enough to stand up and be laughed at, if necessary." Mount Hosmer, near Lansing, Iowa is named after Hosmer; she won a footrace to the summit of the hill during a steamboat layover during the 1850s. During World War II the Liberty ship SS Harriet Hosmer was built in Panama City, Florida, and named in her honor. A book of poetry, Waking Stone: Inventions on the Life Of Harriet Hosmer, by Carole Simmons Oles, was published in 2006. Her sculpture, Puck and Owl, is featured on the Boston Women's Heritage Trail. The Hosmer School in Watertown, Massachusetts is a public elementary school named in her honor. Hosmer made both large and small scale works and also produced work to specific order. Her smaller works were frequently issued in multiples to accommodate demand. Among her most popular were 'Beatrice Cenci', which exists in several versions. Hosmer's Medusa, captured in the midst of her transformation into the woman, covered with snakes, who is capable of turning men into stone. A Sleeping Faun (1865) is now being displayed at the Museum of Fine Arts, Boston. Another version is in Iveagh House, Dublin, see Homan Potterton, 'An American Sculpture at the Dublin Exhibition of 1865: Hariet Hosmer's Sleeping Faun', The Arts in Ireland Autumn 1973. A Waking Faun; a bronze statue of Thomas H. Benton (1866 - 1867) for Lafayette Park, St. Louis. It was created as a companion to "The Sleeping Faun". Bronze gates for the Earl of Brownlow's art gallery at Ashridge Hall. Statues of the queen of Naples as the heroine of Gaeta, and of Queen Isabella of Spain for the Columbian Exposition, Chicago, 1893. ^ Frank, Priscilla (29 May 2015). "The 19th Century American Women Artists You Don't Know, But Should". Retrieved 7 July 2017 – via Huff Post. ^ The Theatre. Wyman & Sons. 1890. ^ "History". Lenox, MA. Retrieved 7 March 2015. ^ "Harriet Hosmer – Civil War Women". www.civilwarwomenblog.com. Retrieved 7 July 2017. One or more of the preceding sentences incorporates text from a publication now in the public domain: Wilson, J. G.; Fiske, J., eds. (1892). "Hosmer, Harriet" . Appletons' Cyclopædia of American Biography. New York: D. Appleton. ^ MacLean, Maggie. "Harriet Hosmer: One of the First Women Artists in the United States". CIvil War Women. Retrieved 7 March 2015. ^ Hosmer, Harriet Goodhue (1912). Harriet Hosmer letters and memories. New York: Moffat, Yard and Company. p. 8. ^ Wittmann, Otto (Spring 1952). "The Italian Experience (American Artists in Italy 1830-1875)". American Quarterly. ^ Williams, Carla (2002). "Whitney, Anne". glbtq.com. Archived from the original on 2007-11-09. Retrieved 2007-11-30. ^ James, Henry (1903). William Wetmore Story and his friends: from letters, diaries and recollections. London: William Blackwood. p. 257. ^ Cronin, Patricia. Harriet Hosmer • Lost and Found. ^ a b c "Sleeping Faun". Museum of Fine Arts, Boston. 2017-02-06. Retrieved 2017-03-14. ^ "Harriet Hosmer, Pioneering Woman Artist". New England Historical Society. Retrieved 30 January 2019. ^ Nichols, K. L. "Women's Art at the World's Columbian Fair & Exposition, Chicago 1893". Retrieved 30 January 2019. ^ Sherwood, Dolly. Harriet Hosmer, University of Missouri Press, pp.102-3; 270-3. ^ Wilson, Scott. Resting Places: The Burial Sites of More Than 14,000 Famous Persons, 3d ed. : 2 (Kindle Locations 22189-22190). McFarland & Company, Inc., Publishers. Kindle Edition. ^ "Harriet Goodhue Hosmer | National Museum of Women in the Arts". nmwa.org. Retrieved 2017-03-14. ^ "Beatrice Cenci, (1857) by Harriet Hosmer :: The Collection :: Art Gallery NSW". nsw.gov.au. Retrieved 4 April 2015. ^ "Puck on a toadstool, (circa 1856) by Harriet Hosmer :: The Collection :: Art Gallery NSW". nsw.gov.au. Retrieved 4 April 2015. ^ "Beatrice Cenci". Art Gallery of New South Wales: Collection. Art Gallery of New South Wales. ^ Williams, Janette (March 6, 2008). "Gift helps Huntington acquire American art". Pasadena Star-News. ^ Cronin, Patricia. Harriet Hosmer - Lost and Found. This article incorporates text from a publication now in the public domain: Chisholm, Hugh, ed. (1911). "Hosmer, Harriet Goodhue" . Encyclopædia Britannica (11th ed.). Cambridge University Press. Culkin, Kate. Harriet Hosmer: A Cultural Biography. Amherst: University of Massachusetts Press, 2010. Maclean, Maggie. "Harriet Hosmer: One of the First Women Artists in the United States". Civil War Women. Retrieved 7 March 2015. The Editors of Encyclopædia Britannica. "Harriet Goodhue Hosmer". Encyclopædia Britannica. Retrieved 7 March 2015. "Harriet Hosmer and the Triumph over Captivity". Radford University. Retrieved 7 March 2015. Cronin, Patricia; preface by Maura Reilly and an essay by William H. Gerdts. (2009). Harriet Hosmer: Lost and Found, A Catalogue Raisonné. Milan: Edizioni Charta. ISBN 9788881587322. Culkin, Kate. Harriet Hosmer: A Cultural Biography. Amherst, MA: University of Massachusetts Press, 2010. Wikimedia Commons has media related to Harriet Goodhue Hosmer. The Winterthur Library Overview of an archival collection on Harriet Hosmer. Hosmer, Harriet; Carr, Cornelia. Harriet Hosmer letters and memories (1913) (Internet Archives). Papers, 1834-1959. Schlesinger Library, Radcliffe Institute, Harvard University.